Today is the 28th day of the government shutdown and President Trump’s decision to hold the U.S. government hostage to an unnecessary border wall. Enough of the temper tantrums from the White House. Enough of the fabricated security crisis on our southern border. Enough of Republicans’ refusal to reopen the government and hold the president accountable. Congress and the president must immediately reopen the government and address the needs of the American people. It’s past time to get back to work. Our country has real issues, and we need to talk about the real state of our union. 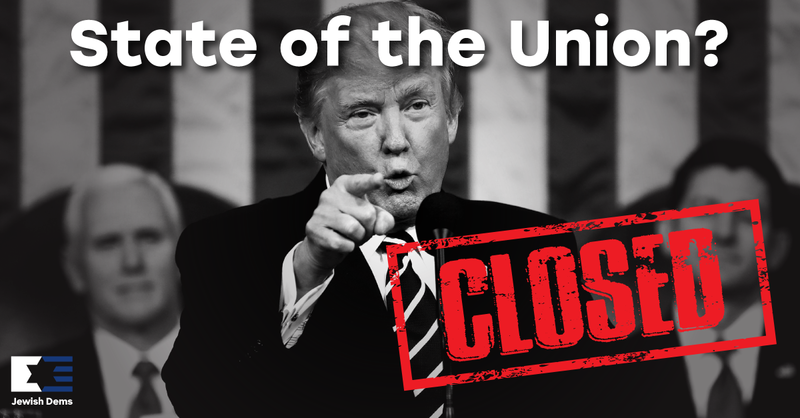 We support Speaker Nancy Pelosi’s decision to disinvite President Trump from delivering the annual State of the Union address to Congress during the shutdown, because – let’s face it – the state of our union is currently CLOSED. As JDCA said earlier this week, President Trump cannot have it both ways, and he’s chosen not to govern. Meanwhile, Jewish Democratic Council of America (JDCA) continues to advocate for our values, speaking out against anti-Semitism in the Women’s March movement and expressing solidarity with sister marches based on the principles of unity, inclusion, and equality. We also have also continued to speak out against Israel being used by Republicans as a political wedge issue. Read on to learn more about how you can take action with JDCA, support our efforts, and join us in advocating for our values in 2019 and beyond. The longer the shutdown continues, the greater the threat to our social, economic, and national security. As airport screeners and engineers, border patrol agents and law enforcement, and others go without pay, our national security is weakened. With 800,000 government employees furloughed, the U.S. economy is weakened. Millions of Americans face the loss of essential services, including food assistance, and the impact has been worse than predicted. For more on the cascading impact of the shutdown on our country, see a list that CNN.com compiled here. Enough! This is why we are leading a national effort demanding that President Trump and Republicans in Congress to reopen the government. Add your name today, and join the thousands of JDCA supporters who have already done so. Women’s marches will be held across the country this weekend. Unfortunately, in the past two years, the leaders of the Women’s March, Inc. movement have failed to unequivocally condemn hatred and bigotry including anti-Semitism, and have failed to create an organization that stands for inclusion, equality, and combatting discrimination, which is what we marched for in January 2017. To march or not to march? That’s up to you. JDCA supports the original objectives of the Women’s March and stands in solidarity with sister marches across the country that are not associated with Women’s March Inc. For a full list of unaffiliated marches, see the list compiled by JTA here. This week, JDCA spoke out following the decision of House Republican leadership to strip Rep. Steve King (R-IA) of his committee assignments given his alignment with white nationalists. While we welcome the action taken against King, JDCA pointedly asked – where is the Republican outrage about Donald Trump? Trump has referred to himself as a “nationalist” and created a moral equivalence between white supremacists and protesters in Charlottesville. The response of Republicans to Donald Trump’s hateful and bigoted rhetoric has been silence, and they must hold him to the same standard. Serve as an integral part of our growing team in Washington, D.C. and work to further Jewish and Democratic values as a member of JDCA’s staff or as an intern. To express interest and find out more, please email [email protected]. In order to expand our team and operations, we need your ongoing support. We are looking to accomplish great things in 2019 and beyond, and with your partnership, we have no doubt that we will succeed.